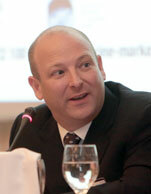 Robert is the Director of Equity Research at AXIA Capital Markets (ACM) covering the transportation sector. ACM is a leading boutique investment bank that focusses on Cyprus, Greece, Portugal and the Transportation markets. Prior to joining ACM, Mr. Perri was the Chief Financial Officer of two US-listed international shipping companies, Box Ships Inc. (NYSE: TEU) and Paragon Shipping Inc. (NASDAQ: PRGN), that specialize in the transportation of containers and drybulk vessels from 2010 until 2015. He was responsible for all the company's accounting and financial activities, and led the Initial Public Offering (IPO) of Box Ships in 2011. Prior to that, Mr. Perri was the Vice President of Finance at a private shipping company that specializes in the global transportation of crude oil and refined oil products. Prior to entering shipping, he spent twelve years in equity research for several investment banks, including Prudential Securities and FAC Equities, covering various industries related to technology and IT services.